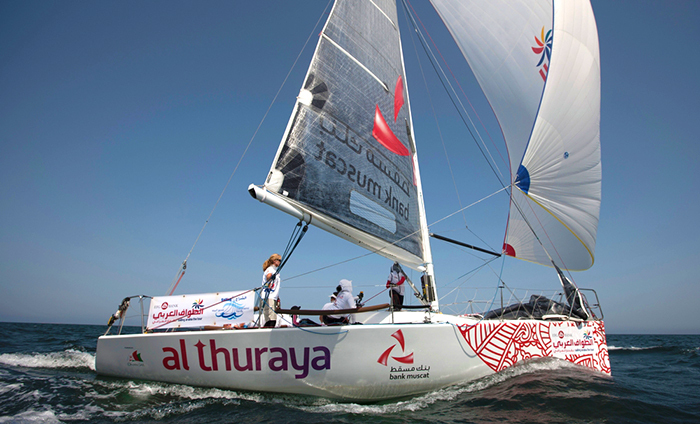 The 2013 EFG Sailing Arabia The Tour has come to a close. February 25 was the final leg from Mussanah to Muscat. It was a whirlwind, as the leg from Dibba to Mussanah had us floating around with no wind during the night for hours, arriving into Mussanah Sunday at 5:00 pm only to have a skipper’s meeting at 7:00 pm, prize giving, quick dinner and bed. The next morning start had us down at the boats at 6:00 am. The leg was very frustrating as one cannot control the wind – or in our case – lack thereof. Keeping attention and enthusiasm as the sails thwack, thwack, and the waves toss the boat around like a toy is difficult. The worst part was that we had crossed tacks with what turned out to be the winning boat, but didn’t go into the shore with them. Ahhhh, hindsight. We started the final leg by heading down the coast under motor, as there wasn’t enough wind. All the boats were in high spirits, and we motored alongside our good friends and Farr 30 mentors, Team BAE, sharing jokes and stories. All of the boats in the fleet have been filled with good sailors, and simply good people. It’s difficult after spending everyday with these people to know that in a day it will be over, and you won’t see them for quite some time. Usually, one can expect to run into other sailors on the sailing circuit, but in this case with many who are here in the Gulf and not competing in the U.S. or European circuits, it may be a year (and doing the SATT) before I will get to see my friends again. There is so much to say in reflection over the SATT 2013 tour, and the leaps and bounds made by the Omani girls! They were true contributing members on the team. It was their boat, and them doing the work. 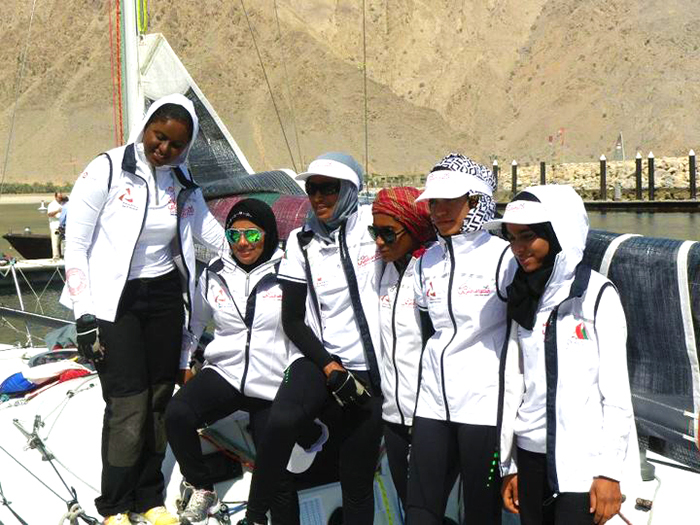 We went from having two Omani women sailors last year, to having 50% this year. The final position of the team does not reflect the amazing leaps and bounds of personal growth or sailing skills that the girls experienced. They had to start taking on jobs, responsibility for their time management, and sailing. Sailing is a true team sport, and they thrived. There is much to be done as the ladies continue to grow, and it is fantastic that Oman Sail is invested in their growth, and the growth of this amazing sport. This tour was very difficult – more difficult than last year, because of the lack of recovery time between races. We had a number of legs where we had to be up at 5:00 am, waited around, finally raced, and then got in at night – only to get up again early in the morning. The added pit stop at Dubai took away a needed day off, and the points allotted the in-port racing meant that certain girls could not be given a break from sailing on those days as well. On the way in to Mussanah we talked to the girls about what they liked about the tour, and most said that they preferred in-port racing as opposed to the offshore. They struggled mightily with the lack of sleep, and the need for ongoing concentration even when there were no competitors around. The demanding weather didn’t faze them, as they all said their favorite leg was the sleigh ride across to Abu Dhabi – which involved 2 of them getting sea sick! 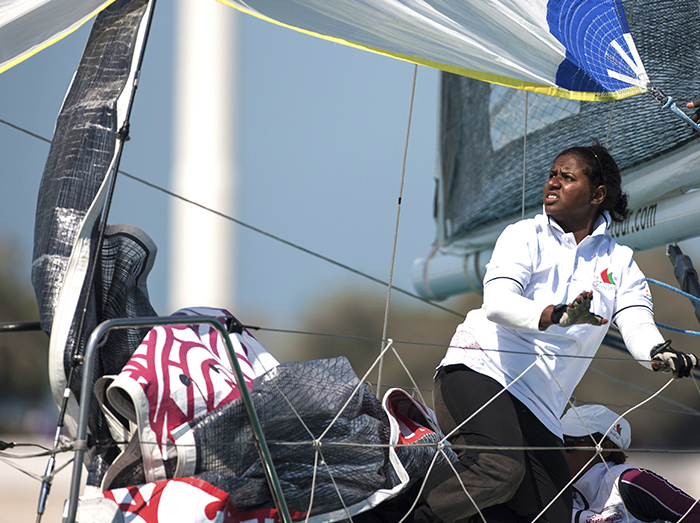 Next, the Omani girls will head to France to race J80s in Brest. It will be a huge fleet, a different boat, and very cold compared to the warm waters and temps of the Gulf. It will be interesting to see how they fare! I unfortunately cannot make it, because I have a job that will be demanding my attention during that time – but I will be watching and encouraging them from afar.